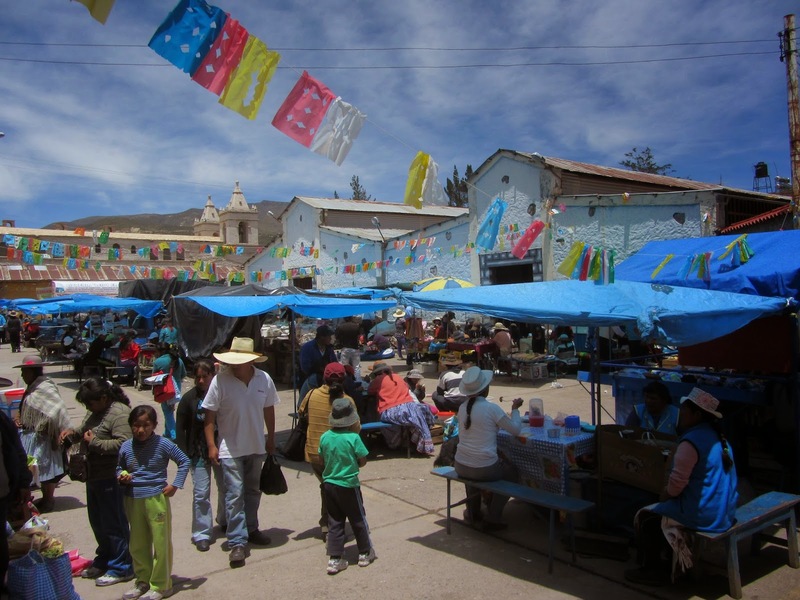 In a December post on the IMTFI blog, Dr. Liz Losh, a UCSD-based media scholar who live blogged IMTFI’s 2013 Conference, referred to the “inherently unwelcome nature” of my research experiments for exploring cash use in an Andean market town. Why might this research have been so unwelcome, at least at first? As part of my broader investigation into how development projects have become engaged in stimulating the cultivation of indigenous identity and putting that identity to work toward creating more economic vibrancy in Andean Peru, I tried to get a better sense of what development actually means at the level of cash changing hands. For my project, that meant repeated attempts to purchase relatively inexpensive items—avocado sandwiches, vegetables, socks, and other wares being sold in the Chivay market—with large cash bills, namely, 50 and 100-sol notes (about $17.50 and $35, respectively). I set vendors on this potentially annoying task to find out how fungible cash really is in practice. Of course, in theory, money is fungible: any five dollars is mutually interchangeable with any other five dollars, and the same goes for one-hundred soles, two-thousand rupees, and any other money amount. Conceptually, it does not matter what notes or denominations or media might be used to compose that particular amount of value. That’s one of the reasons why money has been so important throughout modern history. As a medium of exchange, money has lubricated countless economic transactions. It has long been seen as a technology that eliminated the cumbersomeness of barter. And much more recently, money has taken on even more liquid forms, from credit to today’s mobile money platforms, a core interest of IMTFI. Because of this liquidity, as social theorists have long argued, economic interaction has become so seamless that it has almost completely ceased to be something social. The central market of Chivay. Photo by author. Yet if buying things with money were really so easy, why would my research experiments be so unwelcome? If cash use strips the economic interaction of its social component, why did my annoying attempts to purchase small items with burdensome big bills find relief in vendors’ social ties? This research attends to the non-fungible dimensions of those big bills. Based on what I have found, I argue that in Colca big bills often cannot be spent without the mediation of certain social relations. In other words, a bill’s denomination, or the unit of value it designates (for example, 10 soles, 20 soles, or 50 soles), is sometimes a structural obstacle to cash fungibility: a 50-sol bill can’t always be used to buy a 3-sol bag of tomatoes, and even if it can, the exchange can’t happen immediately if the vendor does not have the right amount of change to return to the buyer. And as a structural obstacle, denomination actually ends up coloring market exchanges, making them more human, more intimate, and even more political than standard social scientific approaches to exchange would have us imagine. This research builds on a number of recent anthropological studies—notably work by Jessica Cattelino (2009), Julie Chu (2010), Bill Maurer (2005), as well as an upcoming collaboration with institute affiliates Anthony Pickles, Vivian Dzokoto, and Taylor Nelms—suggesting that exchanges of money could be key moments of forging social ties, ordinary self-making, cultural value creation, and articulating a broader political orientation. When I would give a 100-sol note for a 3-sol item to one of the market vendors I have been following, I set for them a temporarily unpleasant task—making change—that was both time-intensive and entailed drawing on one’s ties and social networks within the market. They would, in rare moments, tell me that they could not make change, preventing the transaction (a process that can lead, in the aggregate, to significant loss, as Beaman, Magruder, and Robinson  pointed out in a study of Kenyan market vendors). Usually, though, to complete the sale, vendors would initiate the process of creating change in one of two ways. If they had the smaller denominations on hand, they would simply put the change together themselves. More often, though, they would run to a market neighbor or nearby friend to ask if they could sencillar—a Spanish word that means “to simplify” but idiomatically also means “to make small change” (or sencillo)—their large bill. Peru's 100-sol bill. Photo by author. One morning, I attempted to purchase two small avocado sandwiches from Reina, one of the breakfast cart vendors I had been following. She was able to make change, but saw my use of a 100-sol bill as an opportunity to urge me to purchase more, so that the change-making process would be slightly less burdensome for her. Hesitating before closing the exchange, she asked, “¿Dos no más?” “Just two?” Here, the large bill afforded a chance for salesmanship. She wanted me to sweeten the deal, making clear the social element of the exchange actually made it a more profitable one. Brígida, another vendor who tends to ask a small selection of friends for help making change, told me that large cash denominations were like any new tool. People simply had to learn how to use them. So, as a structural obstacle, denomination becomes fungibility’s “potentializing limit,” as Justin Richland puts it (2011). The vendor’s need to figure out how to make change opens up what I have noticed is a productive moment of hesitation. The customer may also hesitate, deciding not only whether to buy something and what to buy, but also, what configuration of coins and bills she or he will use to pay for it, considering the cash she or he will have later that day. These moments of hesitation allow for many parallel interactions to happen: casual conversation that enables customer and vendor to strengthen their alliance, which could play a role in fostering customer loyalty; a moment in which one of the actors is waiting on the other, allowing the vendor to complete another sale; or a pause in which the vendor or customer can observe what else is going on by the town square, and tune in to the broader public culture. Of course, moments of hesitation can also cause harm, bringing about distraction that can leave a vendor or customer vulnerable to robbery (something very rare in Chivay) or miscounting. Yet overall, I found that the interactional moments afforded by the need to economically “activate” the value of large bills by making change, however initially annoying, tended to create and reinforce relationships between customer and vendor, between a vendor and colleagues in the market, and between market actors and the larger public of the market town. Cattelino, Jessica. 2009. Fungibility. American Anthropologist 111(2): 190-200. Chu, Julie Y. 2010. Cosmologies of Credit: Transnational Mobility and the Politics of Destination in China. Durham: Duke University Press. Maurer, Bill. 2005. Mutual Life, Limited: Islamic Banking, Alternative Currencies, Lateral Reason. Princeton: Princeton University Press. Richland, Justin B. 2011. Hopi Tradition as Jurisdiction: On the Potentializing Limits of Hopi Sovereignty. Law & Social Inquiry 36(1): 201-234. Read Eric's full research report here.